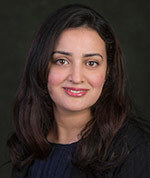 Dr. Dhouha Ouali is the Project and Knowledge Mobilization Manager of the Climate-Related Precipitation Extremes project, within the Global Water Futures program's (GWF), hosted at PCIC. Before taking this position, she worked as a Research Associate with the Marine Environmental Observation Prediction and Response Network. Prior to arriving at PCIC, Dr. Ouali worked as a Climate Scaling Extreme Analyst at the Canadian Centre for Climate Modelling and Analysis. Dr. Dhouha Ouali was awarded her PhD degree in Water Sciences from the INRS-ETE in Quebec, and holds an engineering degree in hydro-meteorology from the National Engineering School of Tunis (ENIT, Tunisia). Her research interests include: flood risk assessment, climate change and climate variability, hydrological and watershed modelling, and extra tropical cyclones. Dr. Ouali's main role is to facilitate the knowledge mobilization of the GWF Climate Extremes project through actively coordinating with key partners and users to ensure the project’s research has impact for the community. Ph. D. in Water Sciences, National Institute of Scientific Research -Research Center of Water, Earth and Environment (INRS-ETE), Quebec, Canada (2013- 2016). MSc. in Water Sciences, National Institute of Scientific Research -Research Center of Water, Earth and Environment (INRS-ETE), Quebec, Canada. (Direct passage, 2012). MSc. in hydraulic and environmental modeling, watershed transfer, National school of engineering of Tunis (ENIT), Tunis El-manar University, Tunis, Tunisia (2009-2011). Hydro-meteorological engineering degree, National school of engineering of Tunis (ENIT), Tunis El-manar University, Tunis, Tunisia (2006-2009). D. Ouali, F. Chebana and T.B.M.J. Ouarda (2015). "Non-linear canonical correlation analysis in regional frequency analysis". Stoch Environ Res Risk Assess. DOI 10.1007/s00477-015-1092-7. D. Ouali, F. Chebana and T.B.M.J. Ouarda (2016). "Quantile regression in regional frequency analysis: a better exploitation of the available information". Journal of Hydrometeorology. DOI: 10.1175/JHM-D-15-0187.1.